"I think that we definitely have been visited by other planets as experimentation. Just like we send the space shuttle into other - you know - into - over the moon and over Mars, and we're now exploring Mars here on Earth." If I had to pin down one reason I enjoy DVD, I'd have to say I love the way it opens me up to films I never, ever would have experienced otherwise. Sometimes there just isn't an art house or film festival handy, and a large segment of the population never gets to see some excellent films. One such film was the 1999 documentary Trekkies. This humorous salute to the Star Trek fan culture was a laugh riot at the same time it presented the true love the fans feel for the show. Although the disc was bare bones (hey, it's Paramount - ), it quickly became a favorite around my house. It even inspired me to write my final paper in English class on the culture that has built up around Trek. Several months after I bought Trekkies, I heard that the same team had completed a similar look at the culture that surrounded the UFO crash at Roswell. I have always been a sucker for conspiracy theories and the like, so the subject matter interested me immediately. Of course, I knew my only hope to see the film was to buy the DVD, but there was no ready-made film franchise to cash in on this time (and really, did Paramount distribute Trekkies because they love independent film?) and I feared a DVD would never surface. Luckily, I was wrong. The DVD is here and better than I expected. If you saw Trekkies, you'll recognize the main character in Six Days in Roswell. It's Richard Kronfeld, oh he of the motorized Captain Pike wheelchair (my favorite moment in that film). This time, we follow his adventures as he journeys down to the 50th anniversary of the supposed UFO crash in Roswell, New Mexico. He comes off as the perpetual innocent, just looking to find out what it takes to get abducted. Or at least, he says, "to make contact." Along the way he meets many interesting characters (some even kookier than he is!) and experiences just about everything that the Roswell festival has to offer, from a "UFO Eating Contest" (pancakes) to an extremely stupid UFO haircut that will make you weep with a mixture of joy at the sight of it and sorrow at the situation he has put himself in. Luckily, it washes out! I love how the filmmaker's showed respect for those who truly believe that something did happened ("What may have happened, may have happened," says one) while not losing sight of the commercial kitsch of it all. I mean, this isn't an X-Files-style investigation here, it is a bunch of people selling blow-up aliens (I have one!) and "Crash Site Rocks: $0.25" ("For a couple of bucks, you can get yourself 8 rocks!"). Director Tim Johnson worked as 2nd Unit Director on Trekkies, and his documentary experience shines here. The film is very well edited, it moves quickly and is structured to provide a logical beginning, middle, and end (each day of the six days in Roswell is given a separate section - NOW the title makes sense!). He gets just the right coverage, with a good mix of "talking heads" and scenery to keep things visually interesting. Likewise, Director of Photography David Doyle (who worked for free) did a great job of capturing the desert landscape. I don't know if I've stressed it enough, so let me say it right out: this is a darn funny film. Maybe the funniest I've seen all year. At the same time, I don't feel I am laughing AT the subjects of the film. I am joining in the celebration of something larger. Or at least weirder. Image Transfer Review: Generally this transfer looks good, but don't expect too much. It was shot on 16 mm, and there is a bit of grain evident in some shots. Other than that, I noted no edge enhancement and no digital artifacts. Colors are a bit washed out but I noticed no color bleeding. Audio Transfer Review: The mono sound here is perfectly suited to the movie. There are few sound effects, and panning and directionality and the like would be irrelevant anyway. Most importantly, dialogue is always easy to understand. Extras Review: Wow! I am simply amazed at the amount of extras on this disc! All are of very high quality as well. I know that this DVD is due in some part to Bill Hunt over at The Digital Bits. He loved the film and helped the filmmaker's get a DVD locked down. I must thank him, because there are a lot of fine extras included here. 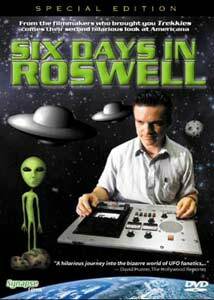 The documentary The Making of Six Days in Roswell runs about 20 minutes. It features outtakes, interviews, and some behind-the-scenes footage. A lot of information is packed in; this isn't one of those hack-job studio promo pieces. Note that a good deal of the information covers the team's first film project, Trekkies. Since Paramount released that disc bare bones, it was nice to see at least something on the making of that remarkable film. The commentary with director Timothy Johnson, producer Roger Nygard, and "actor" Richard Kronfeld is very entertaining as well. The three discuss the making of the film in detail and focus more on anecdotal stories than technical details. They aren't afraid to poke fun at one another either; these guys are obviously good friends. What I found most intriguing about both of these features is the way they redefine the film. After watching either, it becomes clear that the character of "Richard Kronfeld" is just that, a character. He seems a bit too geeky for words in the film and that turns out to be the case. It was interesting to see them explain where the character ended and the real person began. The deleted scenes section is also quite substantial. There are 8 scenes (really just topics by which many related scenes are grouped) that make up about 35 minutes of footage. Every bit of it is as good as anything that wound up in the final film, and I found myself laughing at it quite often. In fact, the quote I chose for this review's header came from a deleted scene. Another interesting feature is the section titled Filmmaker's Early Works. Here we get to see some of (obviously) the early work from the talent behind the film. Some of it is more polished; some is pretty rough. My favorite is a very early film called Victory for the Frog that features the pummeling of some very prominent action figures. Hey, Star Wars on DVD! In addition to the usual trailers (two for Six Days, one for Trekkies) and cast bios, several text extras round out the disc. Under the heading Additional Material, we get UFO trivia, a photo gallery, production notes, reviewer comments, and a list of film festivals at which the movie played. All of this information is presented in a file folder style that conjures images of The X-Files. Six Days in Roswell is a gem of a film. Like Trekkies, it celebrates a segment of the culture that many may not be aware of. While some of the material is funny (ok, most of it is hilarious), it never feels like the filmmakers are insulting or ridiculing these people. Wave your freak flag high and check out this disc!